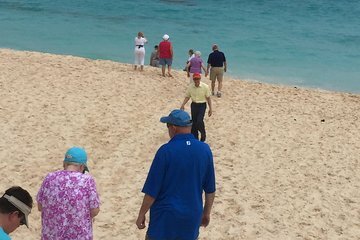 Obtenga vistas de las playas de arena rosada del oeste de las Bermudas en este tour con un pequeño grupo. Viajar con un grupo pequeño en una minivan significa que obtendrás vistas desde todos los lados de la camioneta y disfrutarás de un ambiente íntimo con tu guía y tu grupo. Escuche comentarios interesantes durante el recorrido de medio día, sobre temas que van desde la historia de Bermudas hasta la cultura moderna. También harás una parada de compras en Hamilton para llevarte los recuerdos para llevar a casa. Pequeño grupo de solo 10 personas o menos significa atención personalizada. This is the perfect way to get an over all view of the island of Bermuda. We took this excursion to learn more about the area, beaches, shopping and culture of the island. Stan, our guide was very knowledgeable about the history and culture. Stops were made at beaches, a church, a park and finally the capital city of Hamilton. My biggest disappointment, at no fault of the excursion company, was only having about 40 minutes in Hamilton. We had to arrange our shopping time and site seeing around the ferry boat schedule back to the dock. We could have stayed longer but it would have added another two hours plus onto our schedule in order to get on the next ferry. This is a great excursion for your first day on the island and helps you to plan your next days activities. history of the sights. We never felt rushed or hurried on each stop. The roads are very winding and curvy, so we were afraid to rent a moped. This is definitely the way to go! An air-conditioned van with big windows so we didn't miss anything! My husband and I would definitely recommend this tour!!!! Our guide was knowledgable and friendly. Love Bermuda!!! !